Most of the cab drivers I've ridden with in Chicago have been nice guys just trying to make a living. And I don't know if this guy is one of those guys or if he's a maniac because I don't know him. But I think he could use a little help to get over having a bad week and owing $500 to his insurance company on top of missing a week's worth of work. So, I started this fund-raising page. Like I said, I don't know the guy, but I've contacted City Service to try to get in touch with him so I can give him whatever money gets raised. Hopefully I'll hear back from them. I can totally understand why the company has to discipline him - they don't want it to look like they have a bunch of vigilantes driving around in their cabs. But, to me at least, this cab driver was being brave and trying to protect the one way that he makes a living: his cab. This guy could have run him over but he wasn't going to let him leave. 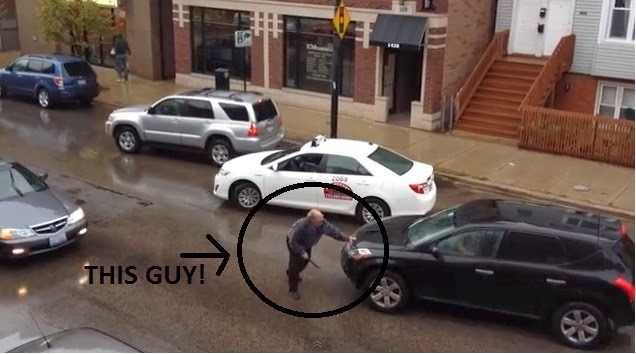 People are saying he should have just gotten the license plate and let the guy drive off because police would then handle everything for him - maybe. I was the victim of a hit and run several years ago. I wasn't even driving; my car was parked. After the car rear-ended me, smashing up the back of my car, their license plate literally fell off directly behind my car before they drove away. I picked it up and called the police, thinking this would be the easiest case to close in the history of hit and runs. Not exactly. First, the police asked me if I had planted the license plate. Was I sure that it fell off the car that hit me and not another car? Had I been drinking? It was about 45 minutes of questioning. Then they took my information, took the license plate as evidence and... didn't contact me... and didn't contact me. I called the police station to try to get information and they said that they couldn't tell me who owned the car because that was classified information and they didn't want me to go vigilante and try to confront the person myself. They also said that even though they had found the owner of the car there was no way to verify that that person was driving the car when it hit me so there was nothing they could do about it and I should just pay for the damages myself. Seriously. My story does have a happy end, though: ultimately, my insurance company paid the police department to release the information to them. Then they contacted that person's insurance company and after a bunch of discussions got them to pay for the damages. This took over a month. Anyway, the moral of the story is: once a hit and run perpetrator leaves the scene, even if you literally HAVE their license plate (not just have it written down), it's not as cut and dry as turning in that info and having everything wrapped up nicely for you. And this cab driver was trying to prevent going through that by getting the guy's insurance information directly (or at least holding him there until the police could arrive and deal with it at the scene). If he'd known the car was stolen I'm sure he wouldn't have been as likely to jump in front of it like this. But he didn't know that. He just knew someone rear-ended him and was trying to drive away. Anyway... if you have a few extra dollars, think of it as a tip for a cab ride, I think this guy could use it. Help this brave cab driver out. Totally agree - I donated to him this morning as well. Wow, nice brave man, if anyone wants to lease your taxi you can contact us.